Click here for the April One Monthly Goal Link-Up! Now the box shape of these tulips was one of those happy mistakes. I misread the pattern but really liked the way it looked so kept it this way! I found this fun backing fabric on clearance. Since this is a gift, I wanted something pretty! There are no tulips growing in my yard. 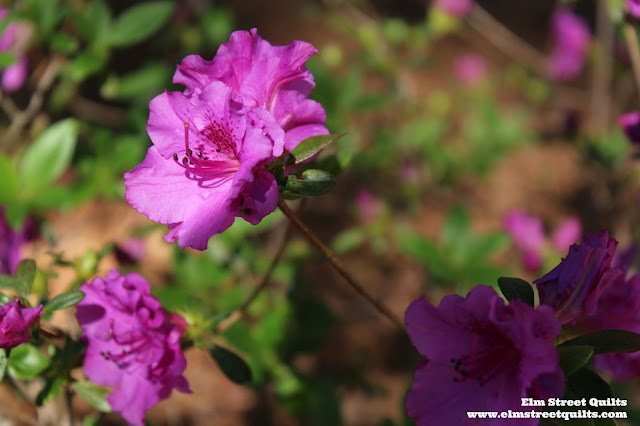 But there are some azalea flowers. So pretty! My tulip table runner will be linked up with Main Crush Monday's, Freemotion by the River, WIP Wednesday's, Let's Bee Social, Midweek Makers. Needle and Thread Thursdays, Finish it Up Friday and Finished or Not Friday. My tuliptable runner is finish #17 for 2017 - many of these (but not all) are minis. Oh so cute! Still waiting for the tulip explosion around here! Thanks for sharing! So cute, love tulips of any kind! Oh how lovely and spring like, I love tulips! Very pretty. It definitely says "spring". Congrats on all the finishes for the year, even if they are mini's, those check marks in the finished column are nice. Such cute flowers, I love tulips! You have 3 lovely tulips in your yard, for now.